Maia didn't want to cooperate during the ultrasound to reveal her gender either, but after the technician prodded at her for a good five minutes she finally uncrossed her legs and gave us a serious look at the goods ;) I would be going crazy not knowing!! Aw! A star for sure! Too cute! Awww, the little one's a cutie. Maybe, baby knew that you guys didn't want to know yet so it's still a secret! Aw, that baby looks CUTE! I think your little one is absolutely adorable! Check out that cute little nose! I used to carry Little One's ultrasound pics with me (I had a zillion of them since I had so many ultrasounds with her being a high risk pregnancy). 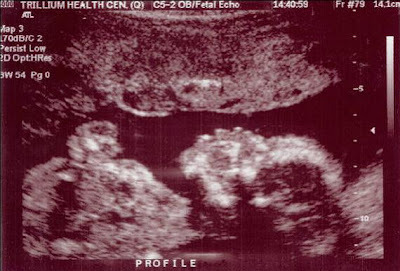 I'd show her ultrasound pics to everyone and anyone who was willing to see them! LOL! Thanks so much for your comments everyone on the little one's picture. I absolutely show any and everyone I can - friends, coworkers, strangers. "Please just indulge me!"